How many Lightning cables do you throw away every year? If you're a big Apple fan, you probably know that the one Achilles Heel in the world of Apple is those cheap cables that break or fray. How about a cable that will last for years, designed to be 10 times more durable than a standard Lightning cable? That's the ZinCable ($19.95), which uses connectors made from a zinc allow and a cable made with reinforced stress points and a strain resistant core. We've got 'em on sale this week for $19.95. 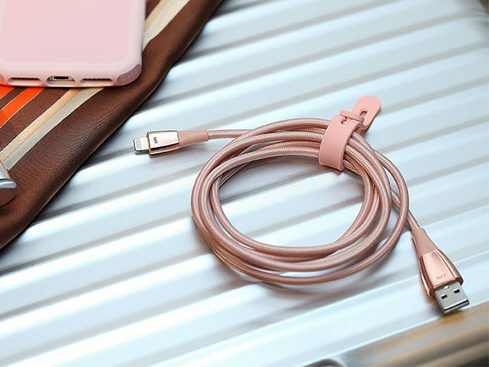 Certified by Apple as Made For iPhone/iPad, and manufactured with care by Just Mobile, the ZinCable actually transfers data 30% faster than a standard Lightning cable. It's designed to bend over 30,000 times and can handle over 10,000 plug/unplug cycles -- if you plug your iPhone in once a day, that's over 27 years! The ZinCable uses a tough braided fiber exterior and has a fiber core for strength and flexibility. That external cover is also designed to be anti-bacterial, anti-stain and anti-mold. Add to that a fracture-resistant TPE jacket and you have a Lightning cable that's ten times more durable than a standard cable. You can buy the ZinCable in either silver or rose gold, but you won't be able to buy it at this price for long. Get one (or more!) today from the Apple World Today Deals Shop.